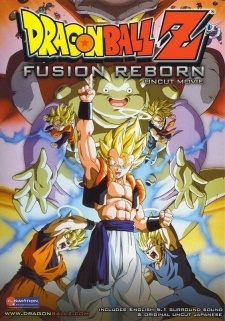 Home » Cartoon » Dragon Ball Z Movie 12 – Fusion Reborn! The movie begins with Goku fighting in another Other World Tournament against Pikkon. At the same time, a teenage "psyche ogre" that is attending the evil-purification machine in Other World is distracted with his heavy metal music. He doesn't pay attention and one of the tanks on the machine gets full and breaks, releasing all of the collected evil energy at once; he is covered by the evil and transformed. As a result, the barrier keeping the dead confined in Other World is destroyed, and many of the dead souls are now wreaking havoc on Earth. This includes previous villains from the Dragon Ball Z series and movies, and also some real life ones like Hitler (simply "The Dictator" in the English version), and Gohan and Videl are called on to help. Bulma and the others gather the Dragonballs, and summon Shenron. They wish for all the undead souls to be returned to the Other World, but Shenron informs them that while he can send them back, there is nothing stopping them from returning, and that something is wrong in the Other World and only King Yemma can resolve the problem. The Grand Kai sends Goku and Pikkon to see King Yemma. When they arrive, they find that the Other World has been changed, filled with colorful jelly bean-like objects which encase structures and people. King Yemma has been imprisoned within one of these objects. Goku and Pikkon attempt to break the barrier, but it absorbs any energy thrown at it. King Yemma informs them that a monster created by the evil spiritual energy is atop the check-in station. Goku begins fighting the monster while Pikkon attempts to destroy the barrier. The monster named Janemba has a childlike mentality and possesses strange powers that allow him to defy reality (such as creating a portal to punch through that leads right to Goku), and even as a Super Saiyan, Goku is losing. He then powers up to Super Saiyan 3 and swiftly dominates Janemba. Though seemingly defeated, Janemba reduces into a smaller, more powerful form. On Earth, Mr. Satan (Hercule in the English version) is winning over the zombies. Frieza and his henchmen arrive shortly after Gohan and Videl get rid of a large group of zombies. Frieza begins to taunt Gohan. Gohan defeats him with one punch and all the other villains flee. Back in the Other World, Pikkon discovers that cursing at the jelly bean prison causes it to crack. Meanwhile, Janemba creates a sword from a spiked mallet, and easily gains the upper hand against Goku, eventually launching him into the Blood Pond and trapping him within. Janemba then slices the Pond down piece by piece until he traps Goku within a tiny portion.